I wasn’t really a baseball fan until 2004. That year my husband and his kids decided to put on the full court press. I would love baseball or else. And the curse was broken. Both my curse of being ambivalent about all sports, and the Curse of the Bambino that had haunted the Red Sox for 86 years. In baseball, teams play almost every night in a season. That’s a lot of games. Every night most of us, both the willing and unwilling, would pile onto the sofa. I’d learn about rules, stats, the personal history of individual players, rivalries that could rival Rome’s hatred of Carthage. Every morning, I would be bombarded with commentary about the commentary. I’d hear speculation about the personal lives of my favourite players. And despite my will, boredom and genuine indifference, I was sucked in. By the time of the World Series, I had my favourite players: Mueller, Varitek, Millar, and Wakefield. Playoff games started later in the evening and went longer. I could never stay up for a whole game. Instead, my ball cap would take my place as a surrogate in the middle of the sofa when I had to crash. We had a stuffed version of the Red Sox mascot, Wally, which sat on top of the television. The remote control was always in the same place. We were a cult. We helped them win. Last night was a great night in Red Sox History. Only three team members remain from the 2004 group, Tek, Ortiz and Wakefield. Wake is 45 years old. He is the oldest active pitcher currently playing in the majors. He throws a knuckleball. Almost no one else does this. He’s kind of handsome. Very classy. Very low key. Last night, after eight frustrating tries, he won his 200th game. We knew, as in those who also live in my cult, that the gods were smiling from the first inning. The Jays bobbled a ball (not technical baseball terms, you understand) and our first runs came in. Then we saw Youk. But he was no Youkilis that we had seen before. You have to understand. 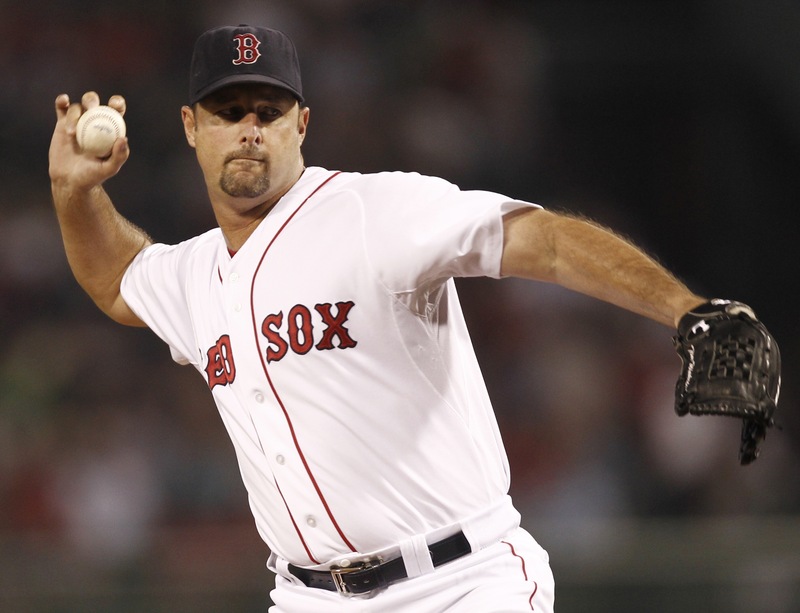 Youk, a great ballplayer, is not what you call conventionally handsome. Facial hair helped disguise this fact. He was clean shaven. Then we saw Gonzalez. He had shaved too. Clearly the boys were trying to shake things up. Then there were the home runs. Two for Pedroia. He wasn’t clean shaven and looked like the muddy chicken he had christened himself. But, I surmise, this is only because his facial hair is as impatient as he is. He probably had shaved only to have an seven o’clcock forest sprout up in time for the game. It didn’t matter. Muddy chicken or hobbit, Carthage must die. That boy can play. Wakefield leaves in the 6th with a 6-5 lead. We piled on the runs. 18-6. In the final inning the crowd was standing, chanting, “Wakefield, “Wakefield.” It was glorious. And I stayed up for the whole thing.